Trainees from Ethiopia, Ghana, Nepal, Tanzania and Zimbabwe, with trainers, at the EIFL Open Science train-the-trainers course in Addis Ababa, Ethiopia, in June 2017. Our guest blogger, Nancy Pontika, is in the middle, front row, wearing a check coat. In June 2017, EIFL invited the global open access full text aggregator CORE to take part in an Open Science train-the-trainer course for universities and research institutions in EIFL partner countries. Our guest blogger, Nancy Pontika, CORE Open Access Aggregation Officer, writes about the experience. CORE is a full text aggregator of open access (OA) scientific content. Our service, which has been running since 2011, aggregates research papers from data providers from all over the world, including institutional and subject repositories and journal publishers. This process, which is called aggregation, allows us to offer search and analytical capabilities over metadata and the full-text of the research papers. CORE’s ability to aggregate the full-text files, and not only metadata, makes CORE a unique service in the research community. With CORE searches, full text publications can be downloaded. CORE currently contains 80,815,905 metadata records and 8,832,834 OA articles, collected from over 6,000 journals and over 3,657 repositories around the world. CORE content comes from 103 countries, and the full text articles are in 53 languages. Our content is constantly growing as we offer institutions the opportunity to register their OA repositories with us, increasing visibility and accessibility of their research. One of CORE’s services is a free API (application programming interface) that can be used by institutions to create apps that perform text mining to enrich metadata of OA publications, or to perform different kinds of semantic analysis of publications. For our data providers, we have created the Repositories Dashboard, a tool designed specifically for repository managers and a Recommender that suggests similar articles to the one the user is looking and which can be easily installed in repositories and open journal systems. The University of Strathclyde in the UK was one of the first institutions to install the CORE Recommender, on Strathprints, the university’s institutional repository. Research into the amount of time users spend in Strathprints found an increase of 58%. In a guest blog for CORE, George Macgregor, the university’s Institutional Repository Coordinator, said the increase was thanks to improvements in the user interface and the introduction of the CORE Recommender. Just 9% of our full text downloads are from Africa, where most of the world’s less developed and least developed countries are located. We believe that the large volume of our scientific content could be a beneficial alternative to those who cannot afford the excessively high subscription prices of scientific journals and books. However, we were concerned that many researchers in less developed countries might not be aware of our existence. Therefore, one of the things that the CORE Team really wanted to do, but did not have the chance to do until recently, was to visit low income and developing countries and to introduce the CORE services. Our wish came true this year, in June, thanks to an invitation we received from EIFL Open Access Programme Manager Iryna Kuchma. EIFL was planning an Open Science train-the-trainer workshop in Addis Ababa, Ethiopia. The 12 participants, from Ethiopia, Ghana, Nepal, Tanzania and Zimbabwe, came from universities and research institutions committed to integrating Open Science into courses for PhD students. My role in the workshop was primarily to introduce the components of Open Science and to explain how OA can be extended to Open Science. I also gave a presentation about CORE, and was a mentor on the last day of the training, when the workshop participants were asked to design and develop an Open Science training course that they would teach when returned home to their affiliated institutions. For most of the workshop participants, this was their first introduction to CORE, and they left the workshop ready to try out CORE and its services. Simon Osei, a participant from Ghana told me: “CORE will help our researchers access articles - they will no longer be groping around in the dark. We are going to promote CORE to our scientists.” Solomon Mekonnen from Addis Ababa University said he would encourage the university to register its OA repository with CORE. Gloria Kadyamatimba from Zimbabwe told me she saw particular value for her institution in CORE’s Recommender tool. While chatting to the workshop participants in Addis Ababa, the extent to which researchers in low income and developing countries are deprived of information became more clear to us. We could see how people in less developed countries lack access to subscription-based research outputs, mostly because they are unaffordable. This is a challenge both for students, who cannot retrieve the appropriate scientific material needed for their assignments, and for researchers, who feel that they are left behind and forgotten. CORE is now more convinced than ever that Open Science and all its components can play an important role. Open Science allows the reproduction of research findings, enables transparency in research methodology, increases social impact of research and saves money and time both for researchers and research institutions. Open Science comprises four concepts. These are OA (free online access to peer-reviewed scholarly outputs); open data (online publication of the research data gathered during a research project and made available for access and reuse); Open Source (online availability of free software for use and adaptation), and Open Reproducible Research (the act of practising Open Science to enable the independent reproducibility of the research results). The FOSTER (Facilitating Open Science Training for European Research) project has developed a useful taxonomy to define and structure the different components of Open Science. 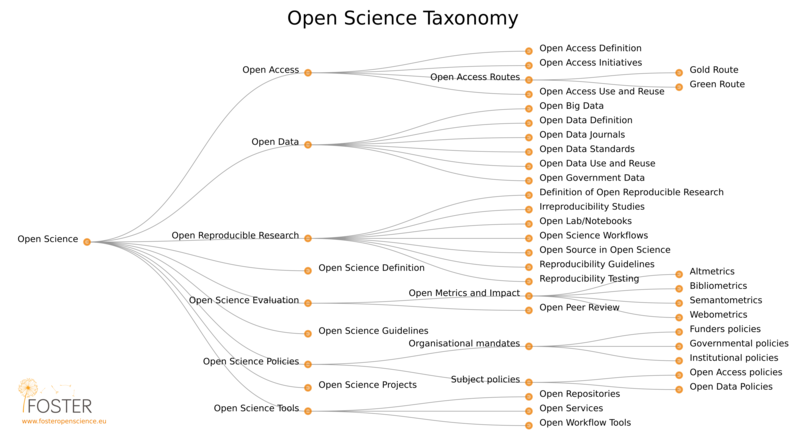 The taxonomy aims to improve understanding of Open Science and to promote Open Science practices. The ability of Open Science to make a difference depends to a high degree on the researchers and their willingness to apply open research practices throughout the whole research lifecycle. We hope that the workshop participants went away with this message in mind, and are now demonstrating the need for Open Science to the researchers in their affiliated institutions. Find out more about CORE in this EIFL webinar presentation by Nancy Pontika in May 2017. If you have a repository or journal that you would like to be included in CORE you can send email with the repository/journal OAI base URL to CORE - theteam[at]core[dot]ac[dot]uk.